Finally!! Back to work on another motorcycle project! I found this bike last November on Craigslist. The dude I got it from bought it running, took it all apart and started a restoration on it. 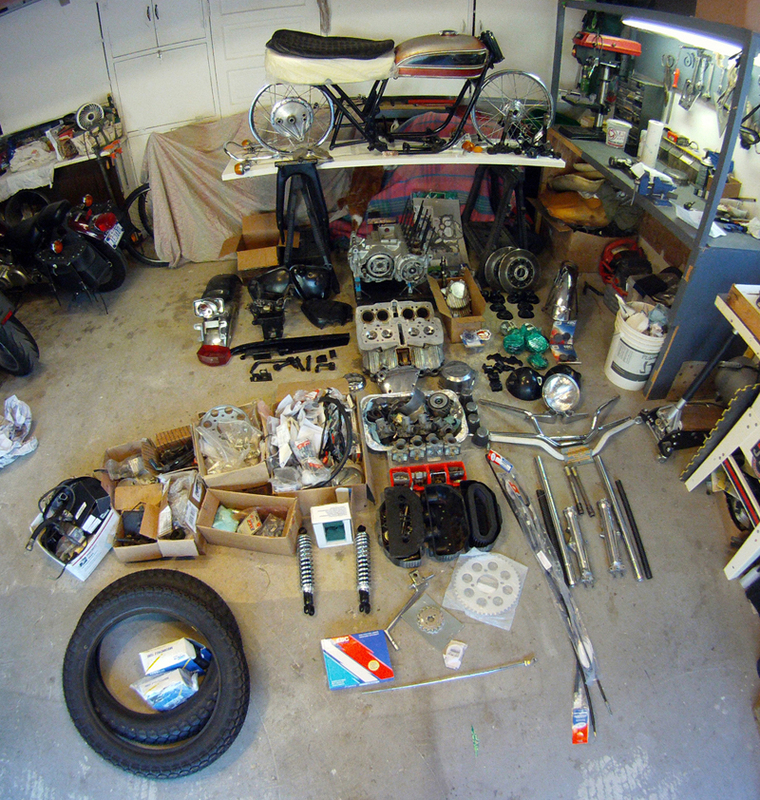 He bought all kinds of new parts like shocks, fork tubes, seat, oil tank, side covers, all the rubber bits, handle bars, cables, tires, chrome steel rims with stainless steel spokes, wire harness and much more. He also had anything that was painted, black powder coated. ALL of the hardware got a new zinc plating. The head was reworked with a “stage 1” job done by Mike Rieck which cost $500 on it’s own. There’s two front disc brake rotors and calipers and all the hardware for a dual front disc conversion. There’s also a lot of spares including an entire set of carbs! The only thing missing is and exhaust system. He said he had about $2K invested in parts and machine shop labor. He was between jobs and didn’t have the time or money to finish the project and so he let it go for the bargain basement price of $750. I’d like to turn this into a nice performance CB750. I won’t be swapping out a whole bunch of parts but I will be improving on what’s already there. First thing to focus on is the engine. It’s partially assembled but I’ll be double checking everything that the previous owner turned any wrenches on. Things like the connecting rods. They should have new bolts in them and not the old ones. They are stretch bolts meant to be used one time. So, here we go down another path of building adventure. Welcome to another journey! !